You’ll want to save plenty of room—or skip dinner altogether—for these photogenic sweet spots that will stack up the “Likes”. Just remember to snap those pics before indulging in colorful, elaborate, and oh-so-tasty helpings of shaved ice, divina cakes, decadent milkshakes, red velvet cookies, and more. These aptly-named creations sold at Little Italy and Balboa Park locations are the kind that you don’t want to ruin by eating. But go ahead and—after snapping some “like”-magnets—dive into everything from cakes, tarts, and cobblers to candy bars. Executive chef Karen Krasne has trained with pastry masters, and it shows. The word “pie” here also applies to savory delights like caramelized onion mushroom pie and Thanksgiving pot pie. But those with a sweet tooth will be drawn to blueberry, peach, and cherry pies that look like they would be cooling on a windowsill in an old cartoon. In fact, everything from the berry crumble pie to the Mississippi mud pie to the pumpkin pie almost looks too good to be real. 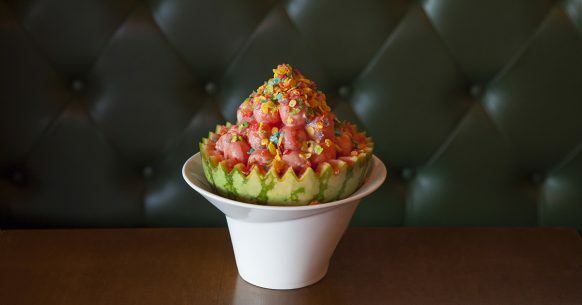 With its colorful Thai-style rolled ice cream, bingsoo shaved ice with toppings like Fruity Pebbles, plus soft serve in fish-shaped waffle cones, this place was made to be photographed. Choose from rolled ice cream flavors like green tea, Thai tea, black sesame, and cereal. Owner Vivian Hernandez-Jackson’s Cuban roots are seen in the guava pastries, cheese rolls, and meat pies. The sweets don’t stop there, though. Her pastries range from gluten-free banana chia seed muffins and salted toffee oatmeal cookies to divina cakes, carrot cakes and other treats that could be mistaken for pieces of art. There’s nothing wrong with tucking into one of their housemade chocolate chip cookie ice cream sandwiches. The real attraction, however, are milkshakes made with things—like that very same ice cream sandwich—that are decadent treats on their own. Pop Tarts, Golden Grahams, Cocoa Pebbles, Nutella. All are options for their milkshakes, which can be topped with camera-friendly whip cream peaks and cereal or cookies. Even when the cookies at this local favorite have familiar flavors, such as chocolate chip or Peanut Butter, there’s something photogenic about them. And that doesn’t even cover the inventive cookie varieties like pancakes-and-bacon, red velvet, rosemary balsamic, and the unmistakably-hued Cookie Monster on their rotating menu. You can’t make a trip to San Diego and miss the World’s Most Award-Winning Donuts? You just can’t. Chef Santiago Campa has taken donuts to a blissfully sugar heaven. Before you even step inside, the sweet smell of sugar is a sign of great things to come. The oversized—often gigantic-sized—donuts come in artfully decadent concoctions including French Toast, Unicorn, Mud Pie, PG&J, Butter Beer, Maple Bacon, Caramelized Pineapple, Monte Cristo—and the list goes on. Get there early as a line begins to form early in the morning.